Wintergreen Fund annual letter to investor for the year ended December 31, 2017. 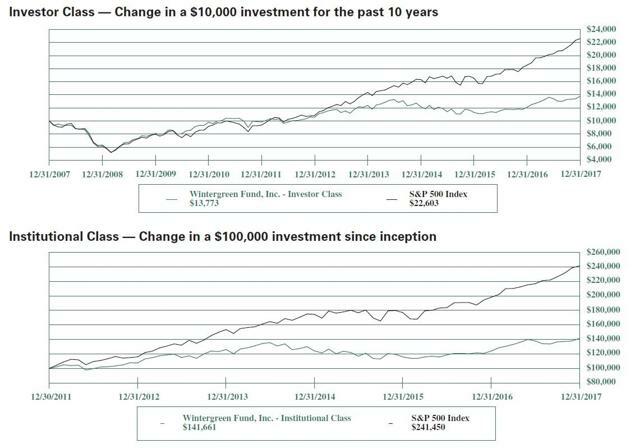 Since inception on October 17, 2005, through December 31, 2017, Wintergreen Fund, Inc.'s (the "Fund") Investor Class had a cumulative return of 105.20%. 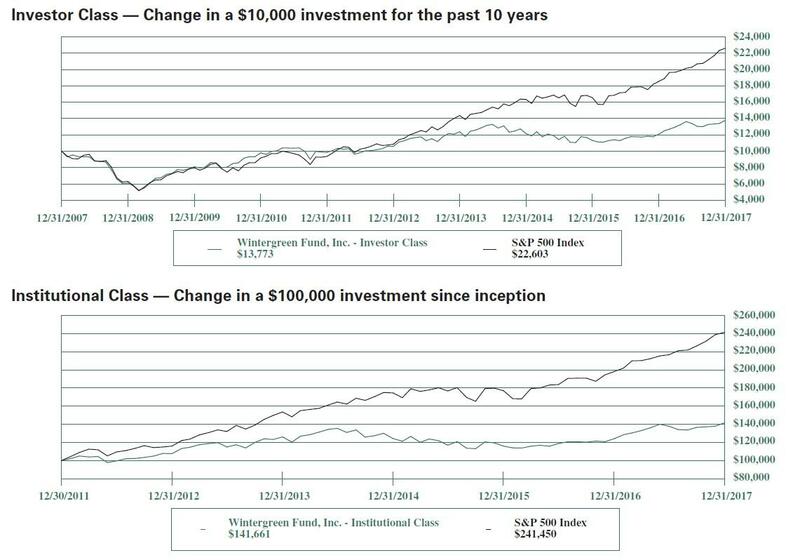 The Fund's Institutional Class had a cumulative return of 41.66% since its inception on December 30, 2011. For the 1-year period ended December 31, 2017, the Fund's Investor Class returned 14.00%, and the Institutional Class returned 14.17%. The Fund had strong 2017 returns from long-term portfolio holdings Reynolds American, Inc. (NYSE:RAI) ("Reynolds"), Compagnie Financiere Richemont SA (OTCPK:CFRUY), and British American Tobacco plc )(NYSE:BTI) ("BAT"). As we mentioned in our 2017 Semi-Annual Report shareholder letter, BAT completed its acquisition of Reynolds during the third quarter of 2017. Securities that underperformed included Birchcliff Energy Ltd. (OTCPK:BIREF), Provident Financial plc (OTCPK:FPLPF) (which was sold during the year), and Baker Hughes, Inc. (NYSE:BHGE) (which was sold during the year). The Fund continued to utilize forward currency contracts, which had a minor negative impact on the Fund's performance during the period. In our 2016 Annual Report shareholder letter, we discussed the importance of the shareholder vote at the annual meeting of shareholders of companies held in investment portfolios. Research by Wintergreen Advisers, LLC, the Fund's investment manager, into the companies that make up the S&P 500 Index, discovered that at such companies' annual meetings, S&P 500 index fund sponsors' pattern of voting with respect to executive compensation plans has contributed to an increase in the costs borne by every shareholder. We refer to these costs as Look-Through Expenses, which are included in company operations expenses, but are not easily apparent or identifiable by most investors. Nevertheless, money that is spent on executive compensation plans is money that is not available for other corporate purposes, including paying dividends to shareholders. In contrast to our view about voting, one prominent index fund sponsor has stated that its "engagement" with companies is more important than its voting record. This sponsor's presentation revealed that during the 2017 proxy season, it participated in over 18,000 company meetings globally and actively engaged with approximately 950 of those companies. Only 100 companies, a relatively small one half of one percent of the meetings held, committed to make changes in response to the sponsor's input. According to publicly available proxy voting records, this sponsor voted 97% of the time in favor of company compensation plans during the same period. The actions of index funds simply do not match their words. 1. The average annual dilution from each company's equity compensation plan: To arrive at this, we calculated the dilution from compensation plans by averaging it over the typical three- to five-year vesting period. On average for the index, it amounted to 2.6% in 2016. 2. The average annual buyback for each company: We found that, on average in 2016, 54% of the shares purchased in stock buyback programs for S&P 500 companies were used to offset the dilution from equity bonus plans. This amounts to average annual buyback being used to offset dilution from equity compensation plans of 1.7% in 2016. The market values at play are staggering: The equity market capitalization of the S&P 500 Index was over $20.2 trillion at year-end 2016, and 4.3% of this amount exceeds $908 billion. This indicates to us that in 2016, S&P 500 index fund investors paid more than $900 billion in hidden expenses. As a truly active manager, Wintergreen considers the Look-Through Expenses of each company as one factor in our investment process. Wintergreen can actively choose to avoid companies with this large overhang. In fact, Wintergreen Fund's own Look-Through Expense, including our management fee, is approximately 2.47%, or a 39% discount, compared to the average management fee advertised by the leading S&P 500 index funds. Alphabet, Inc.'s (NASDAQ:GOOG) (NASDAQ:GOOGL) Internet search service has proven to be indispensable. "Google it" has become a daily command for hundreds of millions of people. Revenues have risen from $16.6 billion in 2007, when the Fund initially invested in this industry leader, to approximately $111 billion in 2017. Cash balances (inclusive of marketable securities) have followed the upward trajectory of revenues, ending at around $102 billion in 2017, compared to about $14 billion a decade earlier. Free cash flows run in the billions every year, enabling the company to branch out to other investments for the future. Company management is, in our view, focused on core operations and has instituted appropriate controls on its so-called "other bets." Alphabet's powerful economic model and capable and visionary leadership are essential ingredients for investments by the Fund for our shareholders. However, toward the end of last year, with the stock crossing quadruple digits for the first time amid seemingly indiscriminate buying by passive funds, our important third criterion - an undervalued price - no longer held. As a true active value investor, we decided to cash in on this enormously profitable 10-year investment to adhere to our sell discipline. While we believe the first two criteria will remain in place, if the shares become undervalued again, we would actively consider deploying Fund capital into the company for our shareholders. We believe that luxury is timeless and in our opinion there is no better luxury goods company than the Swiss group Compagnie Financiere Richemont ("Richemont"). Richemont boasts a portfolio of watches, jewelry, leather goods and accessories from prominent brands Cartier, Piaget, Van Cleef & Arpels, and Montblanc. With approximately 40% (and increasing) of sales in Asia-Pacific, the company is firmly rooted in a region where wealth is growing rapidly. Richemont is also experiencing strong demand in other parts of the world, which creates a steady stream of multicurrency revenues. Like many companies held by the Fund, Richemont produces substantial free cash flows for dividends and share buybacks. With a balance sheet in a large net cash position, the company has much flexibility to pursue growth initiatives such as the proposed acquisition (announced in January) of the voting shares of Yoox Net-a-Porter (OTCPK:YXOXY) that Richemont does not already own. Yoox, according to Richemont, is currently the world's leading online luxury retailer with over three million active customers. It's important for retailers to keep up in the era of e-commerce. Richemont is no exception, and the marriage of Richemont brands with Yoox's online capabilities makes for a formidable union. We encourage you to read more about the Fund and our investment approach at www.wintergreenfund.com. We also encourage you to watch for our new website, which we will launch in the spring. Thank you for your continued investment in Wintergreen Fund.